Continuing from last week with our attempts to conquer our 2018 Games-O-Lution, this week we will be focusing on our 10 x 10 picks! For anyone not familiar with this concept, a 10x10 is ten games played ten times. While some will find this very easy to do, others who have massive game collections will find it more difficult, as they only have so much time and likely want to play as many games as possible. While we might not struggle as much as others with larger game collections, we thought this would be a good challenge to help us get more familiar with games that don't make it to the table very often. Some of the games are quick and easy such as Santorini, while others such as Star Wars: Rebellion are a little more lengthy. Since picking our 10x10 games on Saturday morning, we have already started checking off some plays! We had an itch to play Santorini and managed to get in three games. We also checked off a few other categories from our challenge, this week we played Star Wars: Destiny - a game based on a movie and as per last weeks post, we backed a Kickstarter - Dwar7. Keep checking back for more updates on our 2018 Games-O-Lution progress, and feel free to share your adventures. 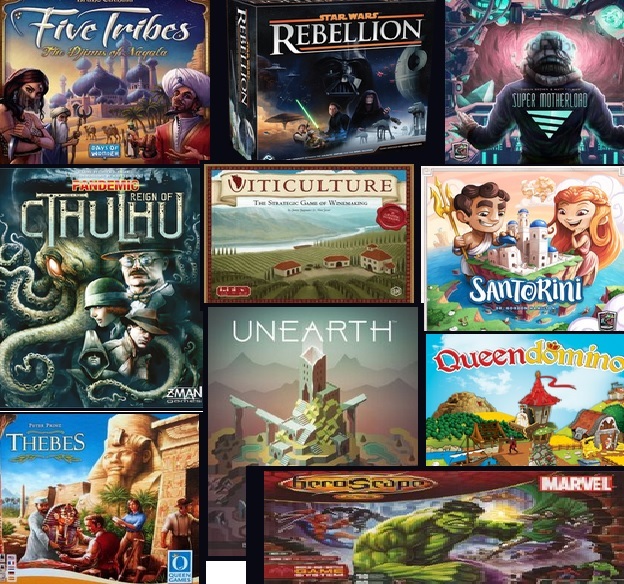 We would love to hear about your own 10x10 or other board game related new years resolution challenges that you are doing! We would also love to know what topics or posts you would like to see in the future, feel free to leave us a comment. This month we are also offering a chance to win a brand new copy of Viceroy!!! Want to win? Like us on Facebook, Follow us on twitter, subscribe to our blog, tag some friends, or tell us your favourite game from our 10x10 in the comments below for an entry. Want more chances to win? The more you share, the more times you'll be entered to win. Love star wars rebellion! Too bad it's so hard to get to the table for me.